Although fall doesn't really seem any different than summer here in Florida, it does mark a shift away from swimming and triathlon to cycling and running. 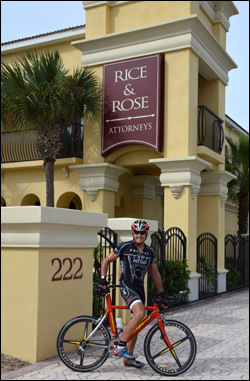 Paul Rice, seen here, of the Rice & Rose Law Firm poses in front of his office building after a 65 mile ride through Volusia and Flagler Counties on a recent Sunday morning. On tap for this fall's cycling season are the MS 150 from St. Augustine to Daytona Beach and back, the Horse Farm 100 and a fun 105 mile ride from Daytona Beach to Gainesville to watch the Florida Gators this football season. Rice is a former competitive runner and triathlete who supports various sports and health related activities in the greater Daytona Beach area. This year the Rice & Rose Law Firm was the title sponsor for the Tigershark Triathlon Series in Daytona Beach Shores, the Ormond Y 10K/5K in Ormond Beach and the inaugural Top Gun Olympic and Sprint Distance Triathlon in Dayona Beach. While cycling is a heart healthy, low impact and enjoyable activity, Rice cautions everyone to ride defensively and with vigilance due to the dangers posed by Florida's crowded roadways and distracted drivers. To reiterate a 70's era State of Florida safe driving campaign slogan, "Arrive Alive."